Corrugated Double Tube (CDT) - The APV ParaTube CDT consists of a single corrugated tube concentrically positioned in a larger diameter outer tube. Tube diameters vary according to flows and the size of any particulates which may be present. The double tube offers a completely unrestricted flow path down the center tube. This design makes them particularly well suited for heating or cooling products with very high pulp or fiber content, or products which contain a substantial quantity of particulates which must be processed with a minimum loss of identity. The APV ParaTube CTT consists of a center tube concentrically positioned in a middle tube which is concentrically located in the outer tube. 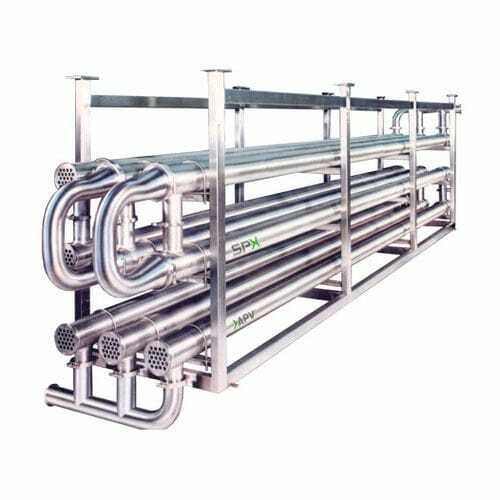 Stainless steel spacers are used to keep the tubes properly separated. The result is an annular space where heat transfer effectively occurs from both sides. The triple tube is generally applied to high viscosity or Newtonian fluids which may or may not contain small fibers or particulates.